NETWORK FINALS: LAST MAN STANDING gained 0.1 in final numbers, but both MACGYVER and THE EXORCIST lost the same, putting the latter at a scary 0.6. In addition, all CW’s shows were down, the new and rerun MASTERS OF ILLUSION by 0.1, and the rerun PENN & TELLER: FOOL US by 0.2. CABLE HIGHLIGHTS: ESPN’s Stanford vs. Washington COLLEGE FOOTBALL game dominated Friday cable at 1.14. 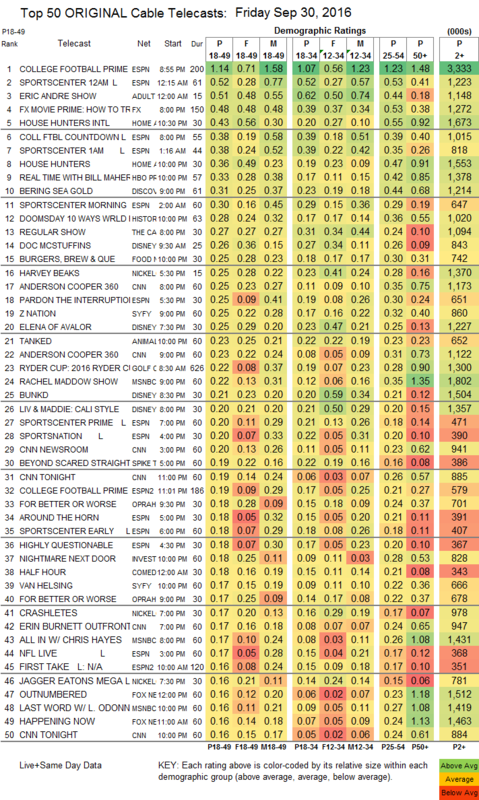 That more than doubled Adult Swim’s ERIC ANDRE SHOW, up 0.06 to 0.52. (The network’s pre-primetime Cartoon Network incarnation narrowly missed the Top 10 with THE REGULAR SHOW at 0.27.) On HGTV, HOUSE HUNTERS INTL rose 0.11 to 0.43, and HOUSE HUNTERS was up 0.03 to 0.36. HBO’s REAL TIME WITH BILL MAHER ticked up to 0.33, and HIGH MAINTENANCE held at 0.11 Discovery’s BERING SEA GOLD slipped 0.02 to 0.31. History’s DOOMSDAY was at 0.28. Food Network’s BURGERS, BREW & QUE was down 0.03 to 0.25. 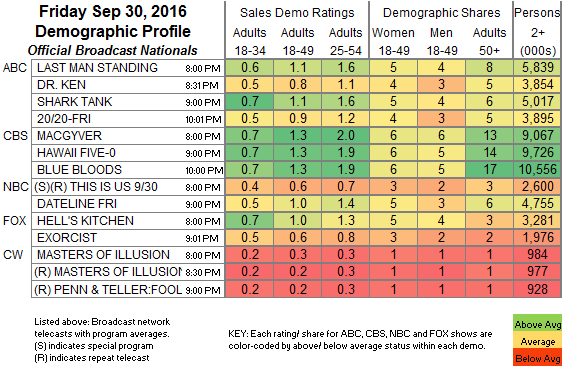 On Syfy, Z NATION dropped 0.06 to 0.25, and VAN HELSING was at 0.17, compared to last week’s 0.22/0.18. OWN’s FOR BETTER OR WORSE was at 0.17. Bravo’s REAL HOUSEWIVES OF MELBOURNE remained at 0.09. Cinemax’s QUARRY lost a tick to 0.05/184K.